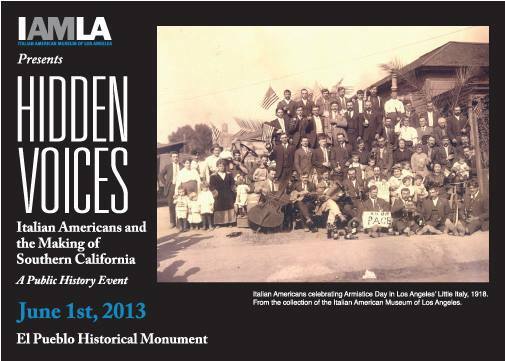 The Italian American Museum of Los Angeles (IAMLA) is hosting Hidden Voices: Italian Americans and the Making of Southern California, a public history conference, on Saturday, June 1 at El Pueblo Historical Monument. The event will feature presentations by scholars, a performance by MusicAntica and educational workshops for youth. Go Metro and save 10% on all IAMLA memberships and merchandise. Offer is valid the day of the event only. Hidden Voices will take place from noon to 4:30 p.m. The event is free and open to the public, RSVPs are appreciated – call 213.485.8432 or email info@italianhall.org. To reach El Pueblo, walk from Union Station or take Metro Bus 84/64 to Main/Paseo De La Plaza. Use Trip Planner to find routes and connections.